Dasha was among the people who watched Boston firefighters and an animal-control officer rescue a small dog from a BMW parked on Newbury Street. She also captured the owner's reaction when he found his rear window popped out and the dog no longer there. Two arrested for animal cruelty after dog found dead. Pardon me, would you have any Grey Poupon - and the number of the city parking clerk? Jill Cetel captured a moment on Newbury Street and is looking for the best caption. Read more. Boston Police report arresting a man from Spofford, NH, with a long history of break-in arrests north of the Merrimack, on charges he broke into a Back Bay home early Sunday. Read more. The Board of Appeal yesterday approved a Thai ice-cream place proposed for 217 Newbury St., between Exeter and Fairfield. Read more. The state has sued a Wakefield company it says improperly removed boilers at a Newbury Street building without taking proper measures to keep asbestos insulation from escaping from the site. Read more. Matthew Bushery gives us a quick overview of Open Newbury Street today. 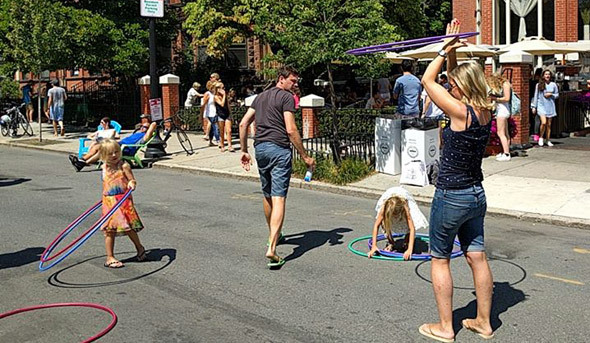 The mayor's office today announced that Newbury Street will turn pedestrian-only on July 23rd, Aug. 13th, and Sept. 10th. Between 10 a.m. and 6 p.m. on those days, the street between Arlington Street and Mass. Ave. will be available for pedestrians to stroll down. Canal Street will have a similar day on July 8. The Boston Licensing Board decides tomorrow whether to let an Italian restaurant open on Newbury Street at Fairfield - and if so, whether to let it stay open until 1 a.m. like its owners want, or midnight, like the Neighborhood Association of the Back Bay wants. Read more. The Zoning Board of Appeals yesterday approved plans to replace a failed Newbury Street froyo joint with a joint that promises its juices can rid your body of toxins. Read more. NECN reports a Chelsea man was arrested pretty quickly after breaking into Gallerie D'Orsay, 33 Newbury Street, around midnight and stealing five pieces of art. His arrest isn't all that surprising given that BPD had at least some officers on Newbury Street to guard against post-Super Bowl problems - and plenty more patrolling nearby. Fire scene. Photo by Brittany Delaney. 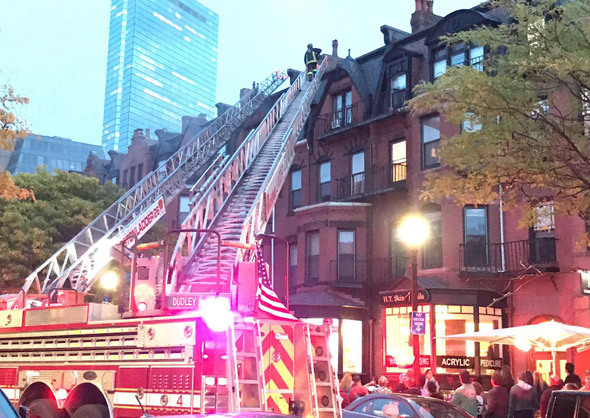 Boston firefighters rushed to 228 Newbury St. around 6:20 p.m. for what turned into a two-alarm fire. The Boston Fire Department estimates damage to the four-story brownstone at $900,000 and that the cause of the fire, which started on the first floor, is under investigation. No injuries were reported. Around 2:10 a.m. at Clarendon Street, the Globe reports. This was about the same time as seven people were being stabbed a few blocks away in the Theater District. Avanti Salon, 20 Newbury St., is suing the owner of Avani Aveda Salon, 75 Newbury St. for trademark violations, saying the newer place's name is deliberately confusing. Read more. Two Boston Police detectives walking down Newbury Street the evening of July 4th say they knew right away the guy sipping a Corona on a restaurant patio was underage - because they'd busted him for the same thing at Fenway Park in April. Read more. So on one Sunday in August, when all the masters of the universe are down on the Vineyard or the Cape or the Hamptons or anywhere but here, Boston shut Newbury Street for a few hours so people could just amble up and down the street. Ron Newman meandered down Newbury Street, from which cars are banned today. Read more. UPDATE: Wabora passed a re-inspection on Aug. 8 and was allowed to re-open. A Boston health inspector today shut Wabora, 254 Newbury St., for a variety of violations that included raw tuna and salmon being kept too warm, a food preparer not washing his or her hands and another handling vegetables with bare hands. Read more. The Boston Sun reports on the Aug. 7 Downtown Crossingization of the street. The Boston Business Journal reports a group of local developers are snapping up the Taj Hotel, where the Ritz used to be. The Boston Licensing Board next week considers a request to allow a Dunkin' Donuts to open at 270 Newbury St., between Fairfield and Gloucester. This would be Newbury Street's first Dunkin' Donuts since the one that used to be down near Newbury Comics closed, saving shoppers the time it would now take them to walk over to one of the Dunkin' Donuts on Boylston Street. Read more.